The Fiesta has made its glorious return to the shores of the US. Most Americans remember the Fiesta as the little car that crumpled like paper when a leaf hit it, and whose life span equated to the trip home from the dealer. Many Americans in fact, do not even remember the Fiesta. The new baby ford comes with an 118-hp, 1.6-liter 4 cylinder engine. You can have either a 5 speed manual or 6 speed automated-manual dual clutch transmission. This is one of the first entry level cars to feature such a transmission, and it does help to increase fuel efficiency and performance. 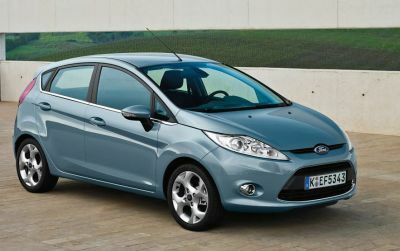 With a curb weight of only 2462 pounds, the new Fiesta is quick enough for an entry level super-compact taking 8.7 seconds to reach 60. 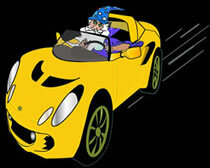 Ford has estimated that fuel efficiency will be 40 highway and 30 city, which competes with many hybrid cars. The new Fiesta is surprisingly comfortable inside. The Dashboard is laid out a bit like a Japanese robot face, but once inside, it seems fairly easy to figure out your way around. The base model comes with no CD player, but does include an aux-in port for mp3 players. 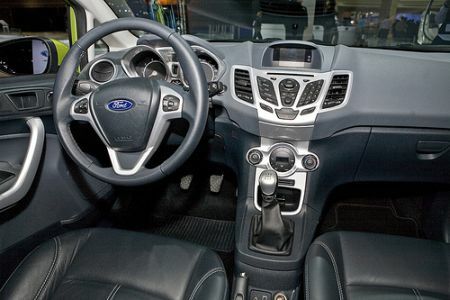 The SE adds the CD player and tilt and telescoping steering wheel, and the SEL and SES trims come standard with the Ford SYNC infotainment system. The storage space in the Fiesta is a bit smaller than similar models like the Honda Fit, but still enough to get most in-city drivers what they need. 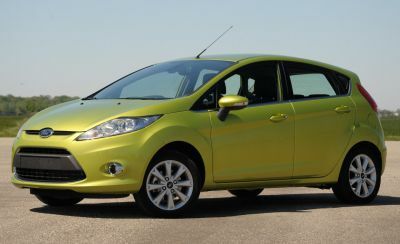 The base model 2011 Ford Fiesta starts at $13,320 MSRP, but you won’t get any special offers at a dealership right now. Dealers are selling these at a premium, not even entertaining offers below MSRP. A fully optioned SES will run you about $17,120. Is it worth the price? If you live in a big city where you need to squeeze into spots, you may opt for this baby in front of other similarly priced cars, such as the Mazda3. But it’s real place on American streets seems very limited. Unless young, hip, urban socialites take up the Fiest banner this may end up being a car with a lot of buzz and little bang in the long run. The CLK cabriolet is heading out into the sunset following its coupe sibling to be replaced by the new E-class cabriolet. 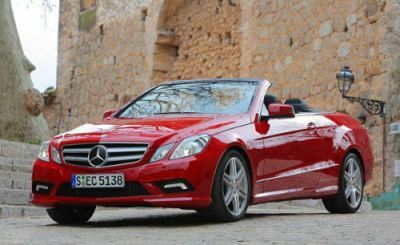 This new Mercedes-Benz convertible still feels like a CLK, which is to say a cross between a C-class and E-class sedan. 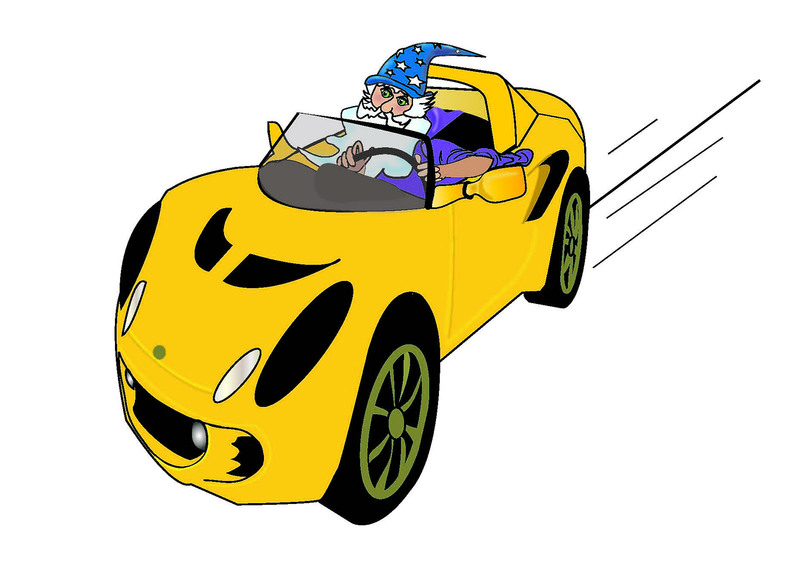 Heavy, rakishly styled, with mediocre power and gas mileage. The car is decent looking with the new angular styling, though we might remember cars with such pronounced and jaunty flares and edges tend to slip out of style rather quickly, a la the Delorean DMC-12. What sort of consumer purchased CLK-class cabriolets anyway? Research points at mid-30s to early 40’s professional women with 0 to 1 children. That market is still there and untended to, apart from the Volvo C70, but lets face it this has the nameplate. The E550 comes with a 382-hp, 5.5-liter V-8 which is decent, but certainly no monster due to the cars 4,048 pounds of curb weight, and with the top down and Aircap wind deflector up increasing drag coefficient to 0.38 (Dodge Durango territory) incidentally rocket fuel consumption up as well. US customers can also choose a 268-hp, 3.5-liter V-6 in the E350, and European consumers get several diesels to choose from. No word on an E63 cab yet, but we can be sure one will show up soon. Nothing overly unique in the interior, standard M-B quality and controls on the layout. A 7 speed automatic transmission is standard. Room for the front passenger is very good, the rear passengers will have a bit less space with 30.1 inches of leg room, but with the top down they can easily sit up straight. 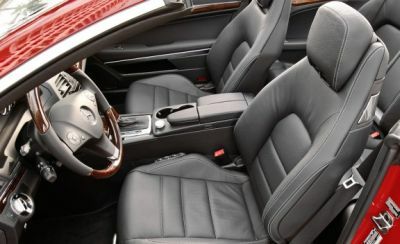 Options include heated seats, rear side airbags, MBrace (M-B’s Version of On-Star), along with the typical appearance and electronic add-ons. 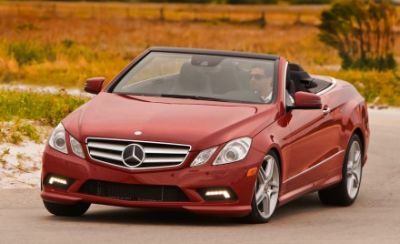 Expect to pay over $60k for a base model E550 cabriolet, as the coupe is coming off with a $55k price tag. The E350 will likely come in around the mid-50k’s. All in all it’s a decent rag-top if you don’t care about the comfort, ease of cleaning, and quiet of a hard top or need more space than a 2 seater, and if you dont care much about the power and drive-ability of a BMW 650i.